Before I start, I'd like to welcome you to the new look for the blog. Thanks to Eguintir, I was able to change the background image to the one I always had planned, but never knew how to do. Hopefully you prefer the new look to the solid green it was before. It is supposed to look like parchment, but I altered it slightly to make it easier on the eyes when reading. Let me know what you think. Better, worse, indifferent? Having a good working secret door is a "must have" for any good adventure in my opinion, and with Nim's work on Secret Doors, my module now has a good working system. I had to alter the code for them to work the way I wanted, but his "blocker door" and "secret placeables" made the doors near enough invisible until detected. 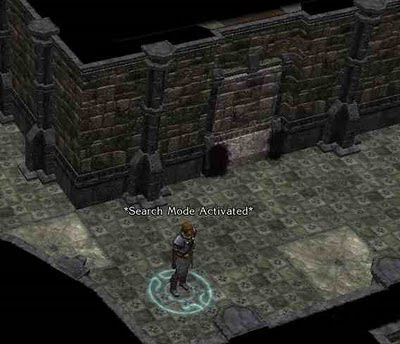 Hovering a mouse over an area or looking for a door transition certainly does not help the player locate them. There is still a very slight difference in colour, but that will not be easily noticed if a player is unaware of it and/or moving past at a pace. However, if they are keeping an eye open for such, then the slight difference will be a clue to "search" harder and if done so, the door will be revealed. I have also taken the coding slightly further in that the secret section can now be easily closed again, or if left unattended, will automatically close itself. Take a look at the screen shots below. The lighting I have used helps emphasise the secret door more than it will usually. The last screen shot is actually a view from behind a secret door covered by a bookcase. I coded it in such a way that if the PC is able to find a way to approach a secret door from a different side, then it would be "obvious" to them and allow for immediate interaction without having to "search" and find it first. While the more observant reader may recognise the area as "new" to anything shown before, I reluctantly have to admit that this is an area I started a long while ago and have still not had time to finish. However, the fact that I have started to work on it again is a good sign. I needed a change from working on previous areas, which, unfortunately, also still need completing. I have also spent some time looking at new monsters for my module. In my search I came across quite a few new models, some of which have had their AI scripted and others that will require a bit more work. My thanks go to Shaugh and his blog Risen Hero for the links that got me started on a search. (Check out his site for a ton of creature links.) I have also incorporated his "Giant Throwing" scripts and will take a closer look at those at some point. I am not going into too much detail about which creatures I have included, as I do not want to give too much away at this stage, but I have tried to download and include as much custom content for the campaign as a whole, so there should be a good mixture over time. I managed to finish Misery Stone this week. It is a fabulous mod and well worth a play. There are one or two points that keep it from a perfect 10 in my opinion. However, it came in at 8.75 by my scoring, which must be the highest I have scored for a NWN2 mod. I left my vote and review a the Vault. I have not altered the way traps work yet, and probably won't. ;) The new secret doors, however, have to have a successful search (if within range) or will automatically be found if searching near to one. I wanted to make it so having a good search skill is beneficial, but that actively searching will override this is the player is struggling to locate it. The only penalty is slower movement for the less skilled. The background is an improvement of course. The image almost looks like a gradient or something cause its very mild so it isnt going to hurt any readability. I am getting pretty interested in this bit of work. I'll be paying even more mind to these blogs when mine finishes. Thanks again for the info for the background. I hope you find teh blog interesting and I welcome any input and help to get my own project finished. 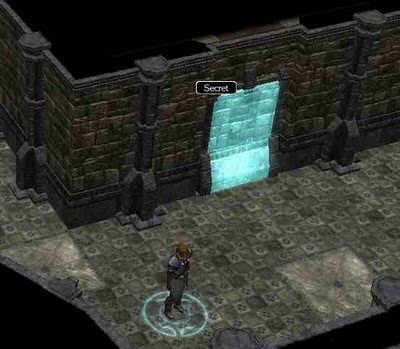 I love secret doors, and I'm pleased to see other modders using them(Wyrin, too, apparently). Judging from the screen, however, the door color stands out a bit--is this to alert the player that a secret *could* be there? As I say in the blog, you can see the door a little easier due to the harsh lighting I used to help demonstrate the door in the first place. However, for play purposes, there is a degree of "giving some clue" as to a secret door being present. I use other secret door "hiding placeables" to ensure it is totally covered if need be. 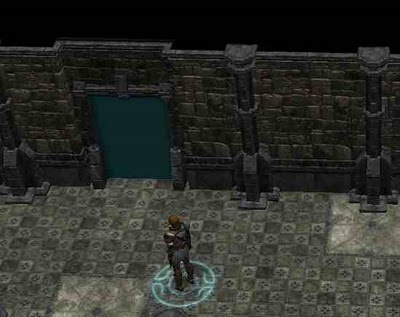 Thereby making some secret doors harder to find (via metagaming) than others. Something that has been coveted since the the first NWN. We've tried just about every solution known to man to pull these off. 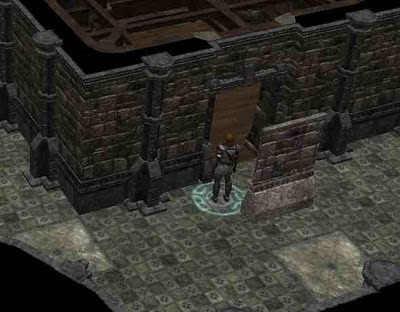 I still think one of the best iterations was the waypoint based spawned placable door system from Shadows of Undrentide. 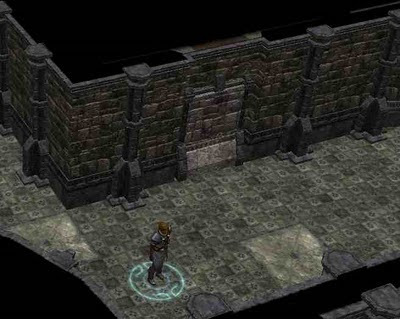 Although, those failed to incorperate the tileset models which is a tradeoff since savvy players know those by sight. You certainly cannot hover over one or recognise an area beyond by normal viewing angle. Custom content is like crack. You add a couple of things then something else is released then next thing you know you have a page of links and a massive hak. For the secret passages I have been using falloutboy's secret doors. It only uses an ipoint and a waypoint and can be placed anywhere. I thing I like about it is that the secret passage is completely invisible and can have no hints before it is found. The draw back to this system is the lack of a realistic looking secret door once it is found. It spawns in a glowing orb that when clicked on jumps the party to the assigned waypoint. For me I have compromised the cool looking effects and abilty to walk through a secret door for a completely invisible hidden passage. SECRET DOORS: Actually, I believe this method by Nim does keep a secret door very well hidden in most circumstances. It's true there may be some "minor" clues, but I am almost certain they are not too obvious to see. As I say in my blog, the way I demonstrate it is deliberately more "obvious" before being found due to lighting, which will change in the final.